TAUK is heavy instrumental rock fusion created by Matt Jalbert (guitar), Charlie Dolan (bass), Alric "A.C." Carter (keyboard-organ), and Isaac Teel (drums). The transcendent instrumental band seamlessly brings together genres as diverse as melodic rock, fusion, gritty funk, progressive rock, ambient, classic rock, hip hop and jazz. The Oyster Bay, New York-based quartet has received accolades from a number of tastemaking authorities, including an “On The Verge” feature in Relix Magazine and frequent rotation for the singles “Mindshift”, “Sweet Revenge”, “Dead Signal” and “In the Basement of the Alamo” on Sirius XM Jam On. 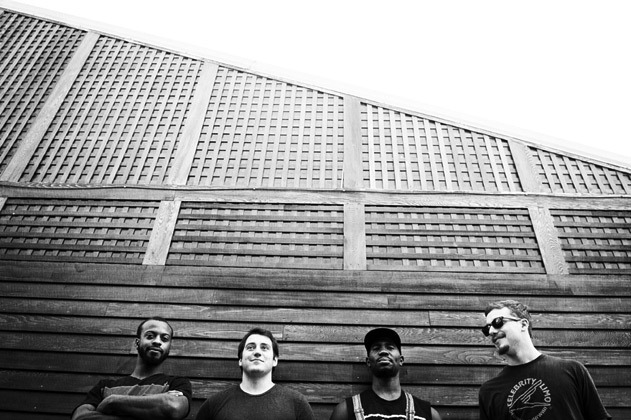 Despite their years of experience as a musical unit, the quartet is a young promising band that Jambase calls “a guaranteed quickly-ascend band.” The Washington Post describes the band by saying: “TAUK's instrumental music melds genres and styles, creating a hard-charging, often melodic fusion that - thanks to a penchant for improv - offers limitless possibilities" and The Deli Magazine singles out the band’s compelling melodic sense through explaining: “the quartet has a rare ability to channel emotional melodic leads, and all without a lead singer." The band’s latest album, Collisions, is a breakthrough in that it finally captures the essence of TAUK’s entrancing live shows. It’s a thoughtfully composed album with captivating hum-along melodies, but this time the band was able to road test the songs, allowing the recorded versions to reflect the group’s adventurous improvisations. The 10-song album spans delicate ethereal textures, highly imaginatively funky drumming, labyrinthine arrangements, and fiery solos—often in the same song. On Collisions the band worked with longtime collaborator Grammy-winning producer Robert Carranza (Mars Volta, Jack Johnson). Carranza helped the band find the optimum mix of song structure, breathing jam sections, and warm & clear fidelity. Also enhancing the experience of Collisions is the album’s stunning puzzle-like cover art done by Jeff Jordan, graphic artist who previously worked with Mars Volta, among others. The album’s deconstructed and post-modern abstractness perfectly reflect the sonic character of the music. Alric "AC" Carter explains: “In the artwork it’s clear to see there are many parts that build the entire picture. It’s like a song where some parts play supporting roles and other sections instantly grab your attention. However, the most important aspect is the bigger picture." TAUK has built a dedicated and loyal fanbase through tireless touring. Festival highlights include Bonnaroo, The Hangout Music Festival, Summer Camp, LOCKN’, Hudson Project, FloydFest, Bear Creek, Art Outside and The Allman Brothers' Peach Fest. TAUK’s broadly appealing musicality has allowed the band to be direct support to such diverse artists as The Funky Meters, Robert Randolph & the Family Band, Papadosio, Lettuce, Karl Denson's Tiny Universe, moe., Dopapod, Tim Reynolds & TR3, Toubab Krewe, The Revivalists and many more.